Finally ending months of speculation since Donald Trump won the U.S. presidency in November of 2016, on just where the President Elect stood on the vaccine issue, Robert F. Kennedy Jr. announced today that he had been appointed by the President Elect to head up a new commission on vaccine safety. 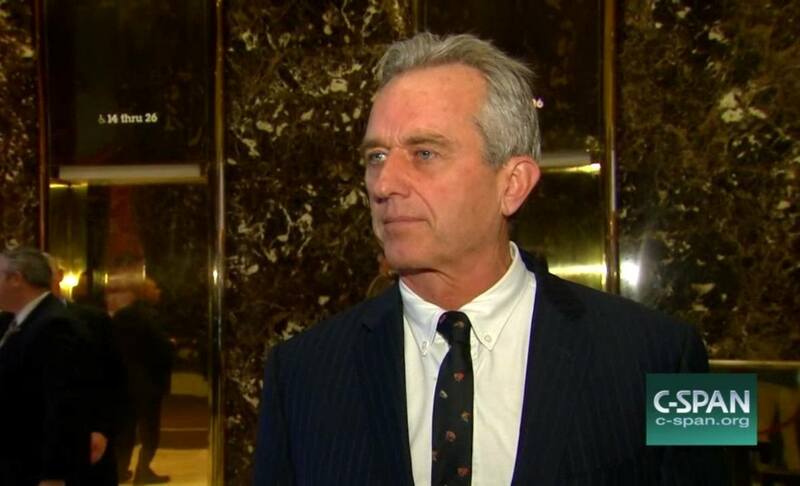 Robert F. Kennedy Jr. is a long time proponent of vaccine safety, and a frequent critic of the government and pharmaceutical censorship of vaccine information. I get emails from a medical association and they are crapping in their pants over this, lol. I have to say, this is wonderful news! Maybe we'll actually get the word out to the world that vaccines are unsafe. I had to laugh at the article in the NYT with pro-vaxers apoplectic about this announcement. To them the idea of putting a skeptic in charge is wrong; as if putting a pro-vaxer will result in a fair judgment. In real science, where the goal is to find truth, you want a skeptic who is going to search for weaknesses in test design, etc., and you testy all possibilities, not just the ones that support your hypotheses. I guess they wanted someone like Paul Profit (er, Offit), who never met a vaccine he didn't like or recommend to provide a fair and honest assessment. What a joke!. While I'm no fan of DJT, I do have to applaud him on this choice. Interesting that he repeated the pro-vaccine mantrum. One can only hope that RFKJr does indeed insist on integrity, and not be bullied into silence like so many in the field who dare ask questions. Just finished reading James Ottar Grundvig's Master Manipulator book about Poul Thorsen who fleeced the CDC out of millions while he manipulated the data on autism and thimerosal in vaccines. The book needs a lot of editing -- for shorter sentences, greater clarity, etc, but it details the deliberate deception and corruption that goes on to defend this extremely profitable and very dangerous vaccine racket. wow this is finally happening someone that is on our side for once,especially someone who has power and make changes for the good. YES... I am more than pleasantly surprised... WOW...Kudos to Trump.. going against BIG pharma and the bought out congresspeople, and the media and the medical establishment and CDC WOW finaly a president with some "guts"